Pineau des Charentes is a French aperitif made in the departments of Charente and Dordogne in western France, near Bordeaux. It is a forified wine ( “mistelle or “vin de liqueur”) made from a blend of Cognac with lightly fermented Merlot & Cabernet Sauvignon grapes. 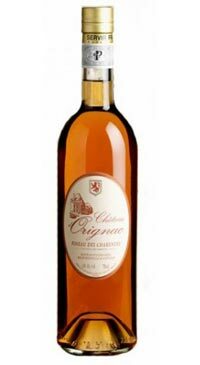 The Chateau d’Orignac Pineau Des CharentesIt is aged in oak barrels for minimum of 5 years. Beautiful amber colour with golden tints, it offers a powerful aromatic nose, with subtle hints of ripe yellow fruits like apricot, honey and raisins, spice and flowers, oranges! It is pleasantly sweet and refreshing with a great harmony between grape flavours and Cognac aromas. Intense, elegant and distinguished, this Pineau is the inimitable meeting of roundness and elegance that makes it one of the most famous ambassadors of its appellation. Always served chilled, the Pineau d’Orignac is not only delicious as an aperitif ; it is also excellent with meals, desserts and cheese. Will keep in fridge once opened as it is sweet with a high alcohol content of 18%.